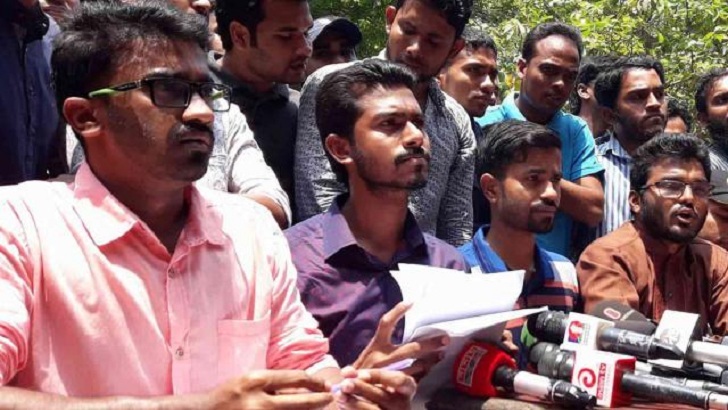 Nurul Haq Nur, who has been elected Dhaka University Central Students' Union (Ducsu) vice-president in the yesterday's historic election, said the whole nation was disappointed by the irregularities and vote-rigging in the polls. Nurul Haq Nur came up with the reaction immediately after DU Vice Chancellor Md Akhtaruzzaman announced the poll's results around 3:20 am on Tuesday. “With the help of the administration the leaders and activists of Bangladesh Chhatra League have rigged votes stuffing ballot papers before starting the election and it’s a disappointment for the University of Dhaka,” he said. “We will take next course of actions after discussing the issue with leaders and activists of our organization as all bodies except BCL have boycotted the polls,” he told to reporters while replying queries. According to the results announced by Md Akhtaruzzaman, Nurul Haq Nur bagged 11,062 votes, shocking BCLs’ Rezwanul Haque Chowdhury Shovon in the polls. Bangladesh Chhatra League's Shovon polled 9,129 and the panel’s GS candidate Golam Rabbani got 10,484 while AGS candidate Saddam Hossain for 15,000 votes winning the polls. Chhatra League Central President Rezwanul Haque Chowdhury Shovon, who was a VP candidate from their panel, shouted slogans protesting the outcome of the polls while the VC declaring the results in the night. In the meanwhile, the panel of Chhatra League, a student wing of Bangladesh Awami League, has won all the 13 posts including vice president and general secretary of Haji Muhammad Mohsin Hall unofficially in the election. Earlier, the vice president and general secretary of Shamsunnahar Hall have been elected from Quota reform panel. Sheikh Tasnim Afroz Emi has been elected as vice president while Afsana Chapa was picked as general secretary of the hall union election. Both were the active participant in the Quota reform movement. The presiding officer came up with the announcement on Monday evening. Earlier in the day, the much-awaited elections to Dhaka University Central Students' Union (Ducsu) ended amid a boycott call by all other panels except the Chhatra League over the allegations of voter intimidation, vote rigging, and irregularities.